According to the website for the Catholic Biblical Association, the NAB is set to be published later this year. The site states: "January 2010: The revised NAB is set to be published by mid-2010. [Wikipedia.]" That is great news! I was hoping for the end of the year, but mid-2010 is just fine with me. Although I am curious as to why the CBA website quotes from Wikipedia? After a bit of web surfing, the citation on wikipedia is taken from the USCCB website for the NAB. It states that: "A revision of the translation of the Old Testament, excluding the Psalter, is currently underway and should be published in mid 2010." I am not sure why it says "excluding the Psalter", since the CBA site says that the NAB Psalms were being re-revised. That could simply be an oversight, since early on the revision wasn't going to include the Psalms. But who knows at this point. More info on the NAB revision from previous posts on this blog can be found here and here. Update: The USCCB site has been updated, as Mary Elizabeth Sperry said it would, to read: "A revision of the translation of the Old Testament, including the Psalter, is currently underway. No publication date has been set. " Good news. I want to buy a NAB again (since my baby boy tore up my last one, that little blasphemer!) but was hesitating when I heard it was being revised. At the moment I'm making do with the JB and NRSV. I am the staff person responsible for the NAB. Unfortunately, we do not yet have a publication date for the NAB, revised edition. (We'll update the website ASAP.) It is unlikely to be published in 2010. Thank you for the update. Do you happen to know if the new edition will include a re-revised Psalms? Thanks for the again for the information. I know that there are a number of people who are interested and looking forward to the publication of the revised NAB. 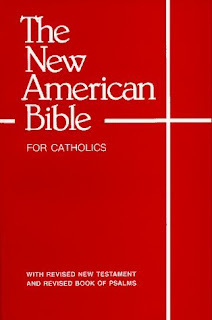 The New American Bible, revised edition (NABRE) will include a revision of the entire Old Testament, including the Book of Psalms. As soon as we have a publication date, there will be a public announcement. I would also renew my request for assistance from the readers of this blog: We are planning an update of the website when the revised edition is published. We would love to hear your suggestions about what we could do to improve the site: additions, structure, etc. (A better search engine is already #1 on our list.) Readers can send suggestions by email to nab at usccb dot org. Please put "website suggestion" as the subject line so that we can keep the ideas together. I can't promise that we'll implement every suggestion, but we will consider them seriously. Do we know if the NAB old testament notes have been revised in the new edition? Yes, the notes and introductions have been revised. Timothy, I don't check this blog every day. But if you'd like to collect questions from your readers and send them to me, I'll answer what I can. Thanks, I will set up a post specifically about questions about the NAB and any recommendations to the website. Mary, will the New Testament be the altered version that has been approved for Liturgy? Also, any chance it would also restore "gates of hell" in Matthew 16:18-19, restore the word "soul" in place of "life" in Matthew 16:26 and Mark 8:36-37, restore "shall" (or "will") in place of "can" in Luke 1:34, and restore "peace to men (or "those") of good will" in Luke 2:14? Will it restore the word "charity" in place of "love" when appropriate? And will the Old Testament match the New in style and translation? Will it restore "Tobias" in place of "Tobiah"? How about "Spirit of God" or "Divine wind" vs "Mighty Wind" in Genesis? Mary, I noticed that St. Mary's Press has a revised NAB. Is this the final revision or are there going to be additional revisions to the NAB? don't quit and keep posting as it just simply very well worth to read it. impatient to looked over additional of your current web content, have a good one!